Today on SCS the featured Stamper is JulieHRR. I love her gallery and have always admired her work. I chose this card. And what better stamp to used than my new Whimsy Owl stamp?! I stamped the owl with Memento tuxedo black ink and colored it with copic markers. I applied pink stickles to the owl's eyelashes. 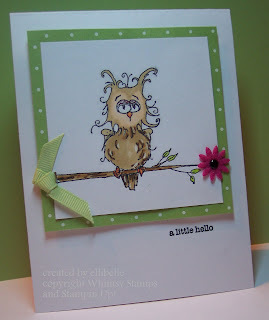 Melissa from mmedesigns did that on one of her owl cards and I just loved that idea! Thanks for the inspiration, Melissa!! The image was adhered to SU's certainly celery prints designer paper and then mounted to the card base, which is GP white with dimensionals. To finish this card off, I added the ribbon and the felt flower with black, and used my stamp-a-majig to stamp the sentiment. Accessories: celery grosgrain ribbon, felt flower, brad - all SU, stickles glitter, dimensionals. This is SO cute! JulieHRR would be proud! Too cute...that image is adorable!! What an adorable image! Love your coloring. Super cute card. This is so adorable!! What a sweet image. Great job on the FSchallenge! Oh my goodness what a cutie! I just adore that owl. You did a great job!! THe colors are perfect! This is really cute - lovely card. That owl is cracking me up--looks like he had a rough night! ;) Very cute card! LOL! That owl cracks me up! Perfect colors, and love the clean layout.